UFC middleweights Chris Weidman and Kelvin Gastelum went to war in last night’s UFC on FOX 25 event from Long Island. Surging UFC middleweight contender Gegard Mousasi picked up his fifth win in a row at last night’s UFC 210 pay-per-view event in Buffalo, New York by earning a second-round TKO victory over former division champion Chris Weidman. Unfortunately for Mousasi, his victory over Weidman came in somewhat of a controversial fashion. Mousasi landed a pair of knees on Weidman midway through the fights second round that had Weidman in a world of hurt. However, the referee thought that the second knee that Mousasi landed came while Weidman’s hands were on the canvas, which would make the strike illegal. After watching that replay, it was clear that Wediman’s hands had left the floor just micro-seconds prior to Mousasi landing the second knee. With that said, the strike was eventually deemed legal and after some confusion inside the cage the referee called a stop to the contest after talking with the doctor. Gegard Mousasi spoke about the controversial victory at last night’s UFC 210 post-fight press conference. As for an immediate rematch, Gegard had this to say. Gegard, who is now a free agent, is looking to get paid what he is worth in his next contract. 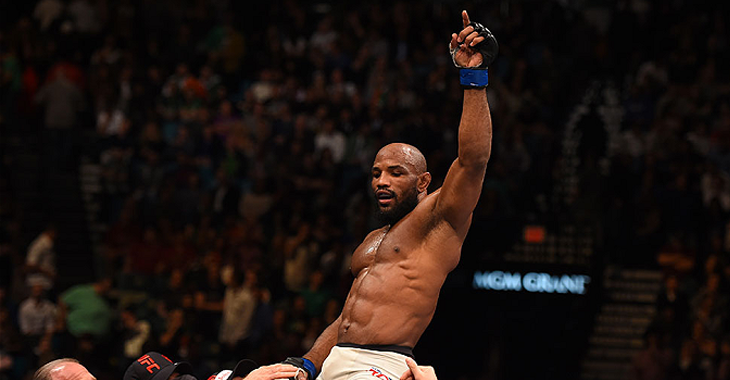 Yoel Romero shocked the crowd at Madison Square Garden by scoring a highlight reel third-round knockout victory over Chris Weidman. Should Yoel Romero be the next man to challenge Michael Bisping for the middleweight title next? Chris Weidman Will Fight at UFC 205 in New York! UFC 205, which will mark the UFC’s long-awaited debut in New York City, New York, is finally starting to take shape. Last week, the card grew with the addition of several dynamite match ups, including a strawweight title fight between Joanna Jedrzejczyk and Karolina Kowalkiewicz, a women’s bantamweight bout between recent champ Miesha Tate and Raquel Pennington, and a featherweight bout between former lightweight champ Frankie Edgar and Jeremy Stephens. Then, last night, the card finally got its main event, as a long-rumored lightweight title fight between reigning lightweight champion Eddie Alvarez and reigning featherweight champion Conor McGregor was finally made official. Today, the high-profile UFC 205 announcements continue, as a middleweight showdown between former middleweight champion Chris Weidman and Cuban Olympian Yoel Romero has officially been tacked onto the bill. Announced on @BoomerandCarton by @danawhite: @ChrisWeidmanUFC vs. @YoelRomeroMMA is official for #UFC205. This bout was one of the very first to be rumored for this hotly anticipated card. 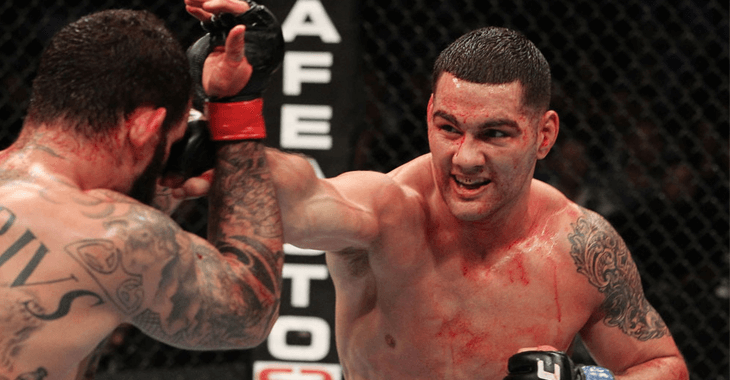 It’s fruition, however, was barred by a minor contract dispute between Weidman and the UFC. Thankfully, those issues seem to have been squashed, as the bout is now officially a go. This contest will mark Weidman’s first steps into the Octagon since UFC 194 in December of 2015, when he succumbed to fourth-round punches, and surrendered the UFC middleweight title to Luke Rockhold in the process. Prior to that loss, Weidman was undefeated across his first 13 fights – a stretch that included two wins over middleweight legend Anderson Silva, as well as defeats of Lyoto Machida and Vitor Belfort. Romero, meanwhile, has also not stepped foot in the Octagon since UFC 194. On that night, he scored a controversial split decision over fellow contender Ronaldo “Jacare” Souza, extending his win-streak to seven in the process. Unfortunately, Romero’s progress was then slowed when he was flagged by USADA for the growth hormone release stimulator ibutamoren – a hiccup that was later proven to be the result of his using a tainted supplement. The winner of Weidman and Romero’s UFC 205 showdown could well be awarded a shot at the winner of UFC 204’s Michael Bisping vs. Dan Henderson middleweight title fight. Of course, that honor could also be awarded to the winner of Rockhold and Jacare’s November showdown in Australia. UFC 205 will occur inside New York City’s hallowed Madison Square Garden on November 12.